I love any opportunity to reach out to all the wonderful people who share common ideals of embracing what is best for our children, our homes and the planet. 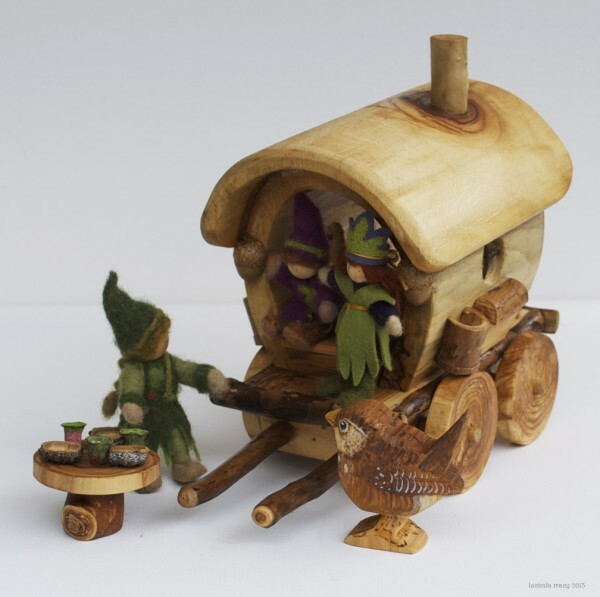 And in the very heart of this matter, is what my work and the Willodel shop is all about. All my life I have been passionate about the natural world, about art, about self-sufficiency, about creativity and original thought. 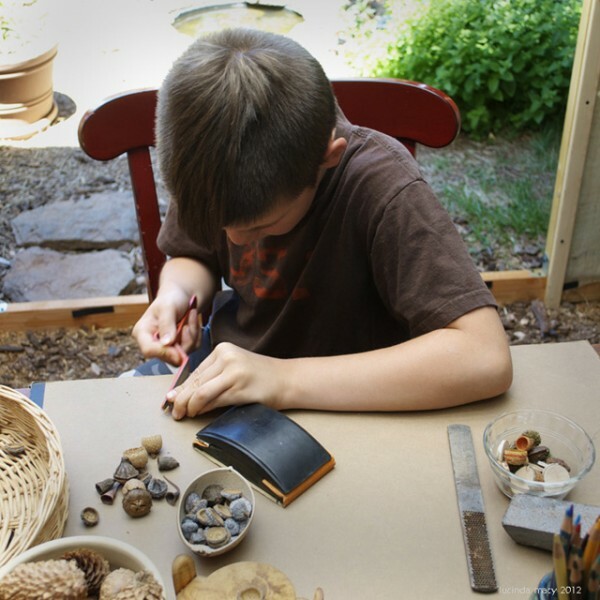 What began as “play” as a child when I asked to build things out of wood and was given my grandfather’s old woodworking hand tools, turned into a life long journey and “work” that helped me raise a family and support myself all along the way. I was also given encouragement and freedom to make art and sew. This kind of path and journey is one that I think all children should have the opportunity to explore, to find things they love doing and that they develop into life long passions. This is a primary reason that on my blogs I regularly create tutorials for families to learn new things and learn from what I have learned. I hope to make more learning materials in my shop as well. This is a learning set of the metamorphosis life cycle. 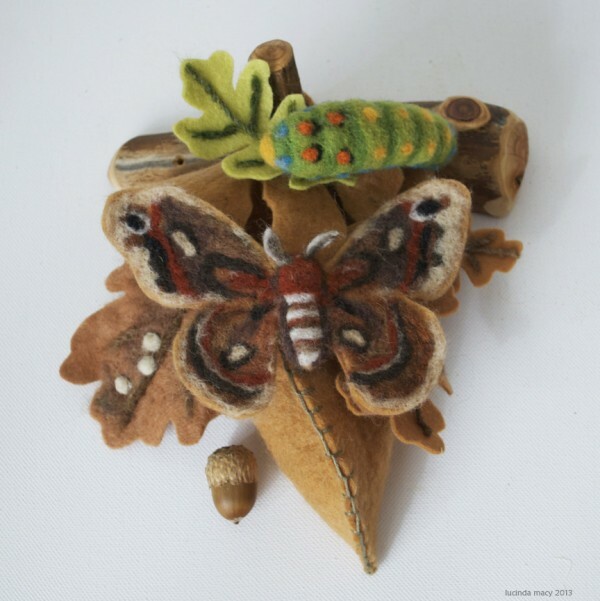 It includes all the stages of the moth, a pouch to put them in and wooden branch hook to hang it on. Also an information sheet. 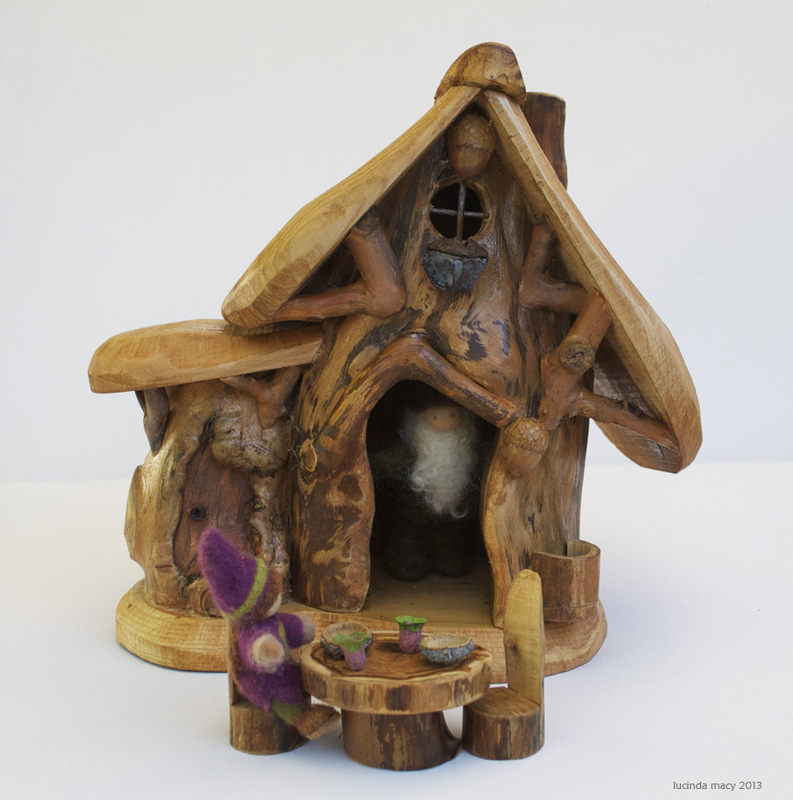 This piece is made from hand gathered, windfall aspen and hand milled cedar. It is sealed with beeswax and natural oils. I have found that if children are encouraged to develop their natural inclinations through their play, they develop a “can do “ attitude towards life and also take pride in their accomplishments. I think this is just as important for adults, to find creative processes which give them that sense of accomplishment and fulfillment . I encourage this activity through my blog tutorials. 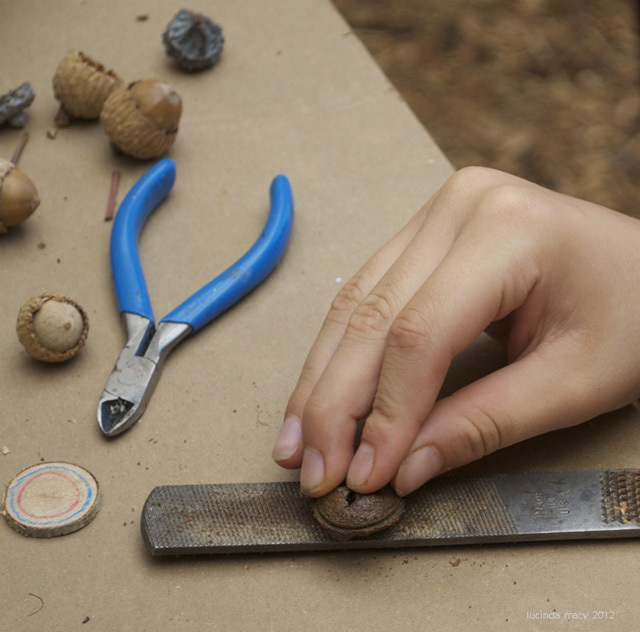 Wonderful “dishes” can readily be made with handtools out of seed pods such as acorn caps and gum nuts. 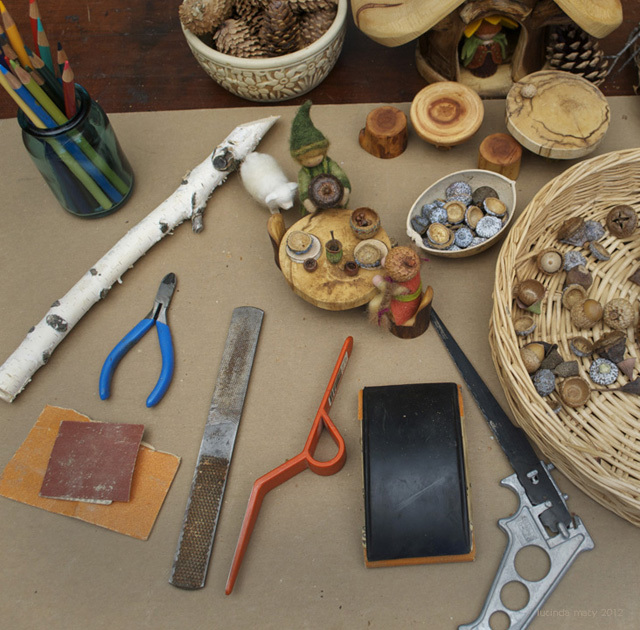 This is a lovely adventure of gathering, making and using! 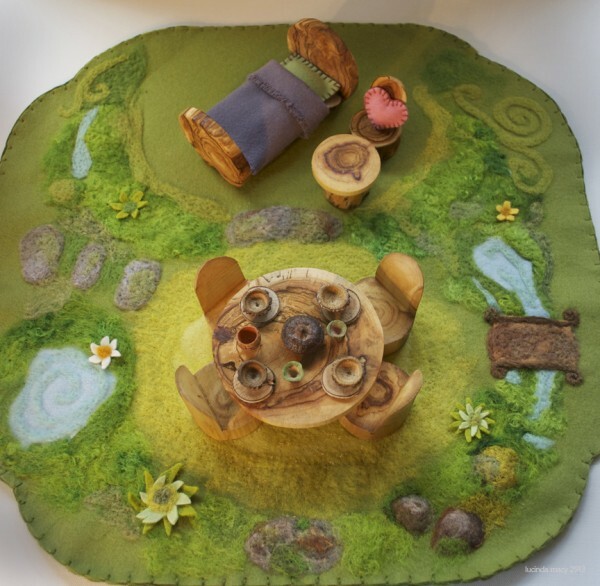 Developing the yard for natural habitat and making it a wondrous play space that children can help with is delightful! In the Willodel shop you find ususual things, made to inspire, to delight and to learn from and with. 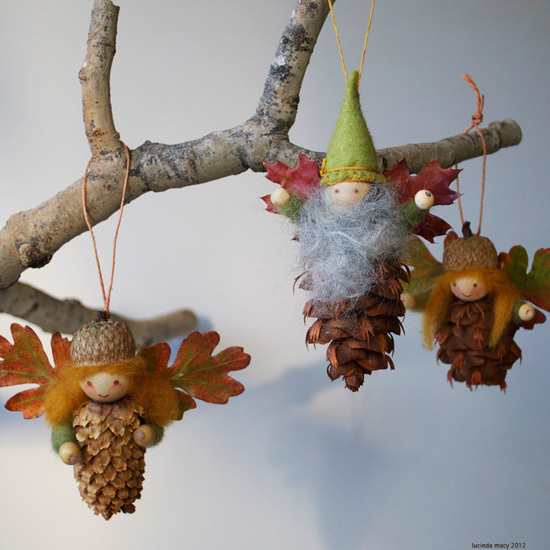 They embody the spirit and beauty of Nature, whimsy to stir the imagination and provoke creative play. They also invite making things to go with the pieces themselves. The materials, natural wood and bent twigs, hand made felt and wool naturally dyed wool, lovely artwork and wee folk, create a stage upon which stories and adventure can come to life. Everything you find in my shop are things that I love and have a great desire to share and inspire more of it’s kind. The colors, the textures and the feel of it all is very important. It is as unique as the each of our souls are unique and as different as the individual story we each have to tell. The Gypsy Wagon! Stirring romantic notions in us all! 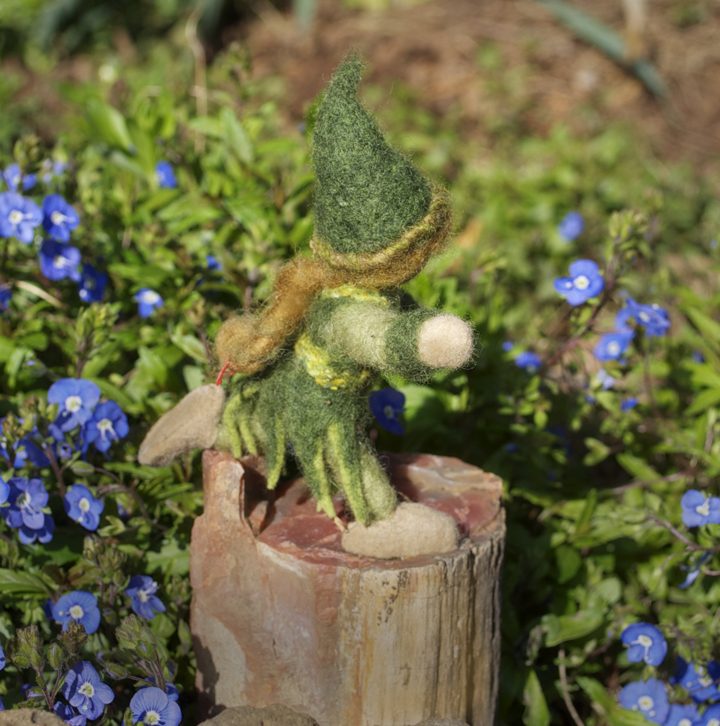 The Elves, the Wrens, the Gnomes~ they all want to come! The wonderful people that I have met through my work enriches my life every way. Their joy and thoughts forever inspire and provoke me to make and share more! Without them this work would not be the same. The interaction with the families that receive my pieces is part of the larger picture of the whole process. It is the great vision of the beautiful network of people embracing similar values and desires , very much strengthening the belief that what is truly good is still very safe in the hearts of many. This contact inspires more and greater creations, just as each time a piece of my work travels to a new and loving home and spreads happiness and joy, it is a completion of a circle. This, of course, confirms that I am doing exactly the right thing! Thank you all and keep busy with all the wonderful things you aspire to do! I am a great believer in the “play mat”. I think it creates a special space and place for the stirring of the imagination and ones own creative ideas. 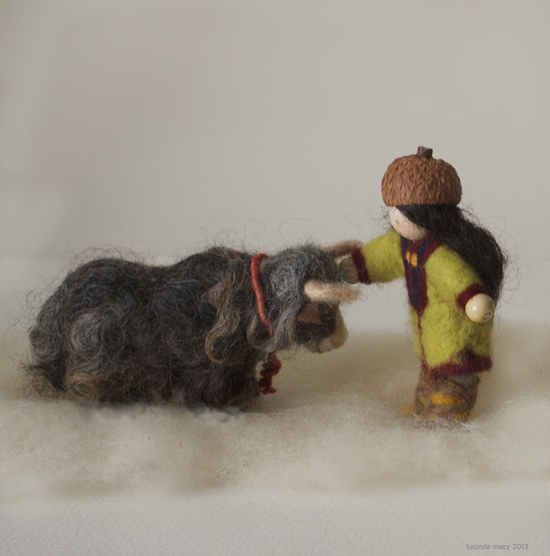 It also is an opportunity to work with wool and felt, which I love just as much as wood. 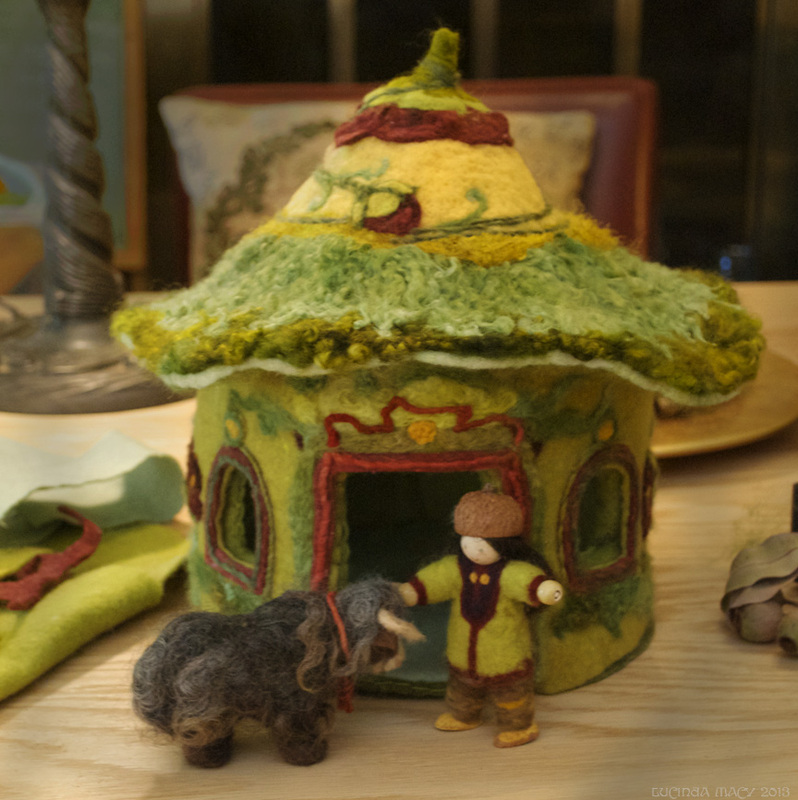 This is a project I am working on now, with home dyed natural felt, the inspiration being wild peony flowers, which are felted on the sides and the roof. 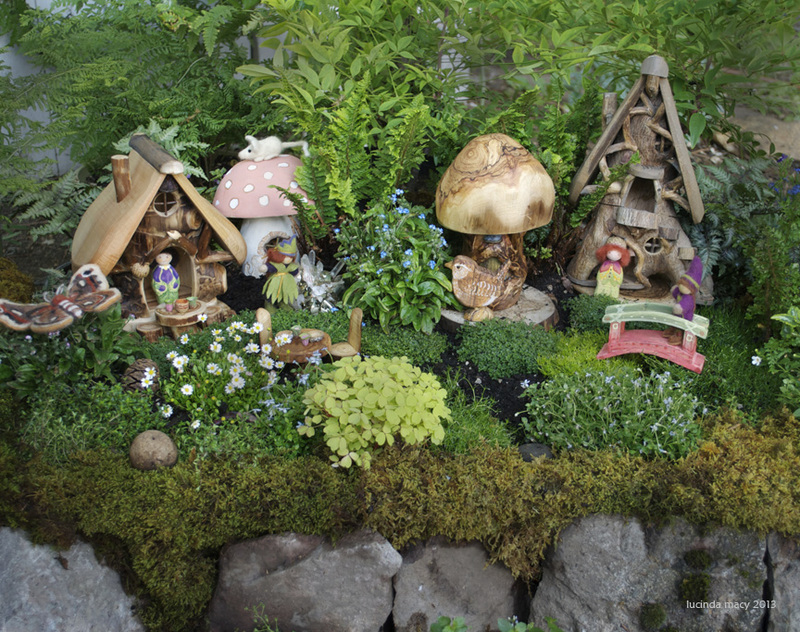 The Fairy Garden is our Summer project. It was started in a large rectangular cement mixing tub, so it can theoretically be moved in winter. Adding details such as a creek and a pond and many small things will be endless fun! For more inspiration and information, please follow these links and thank you so much! 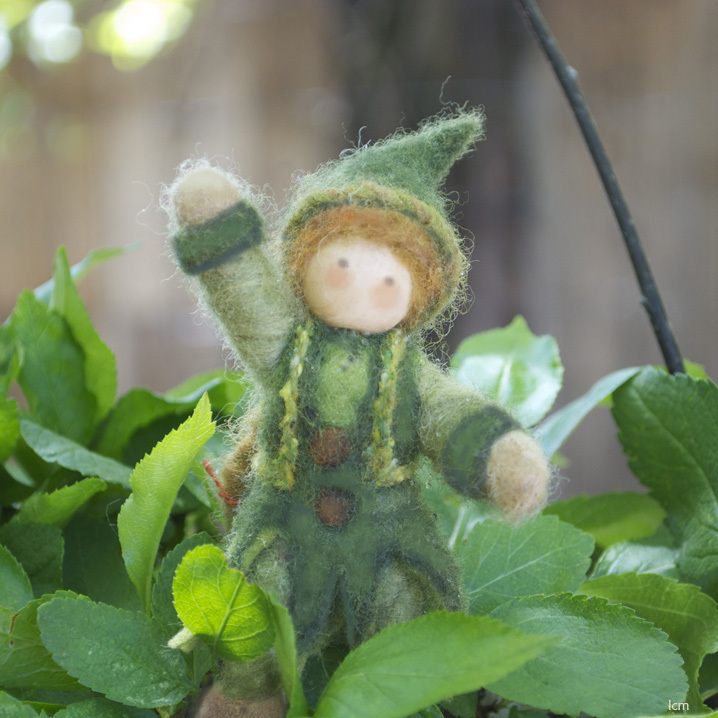 With so many stories to tell and much imagination to express, making wee folk come to life is a rewarding and delightful work. 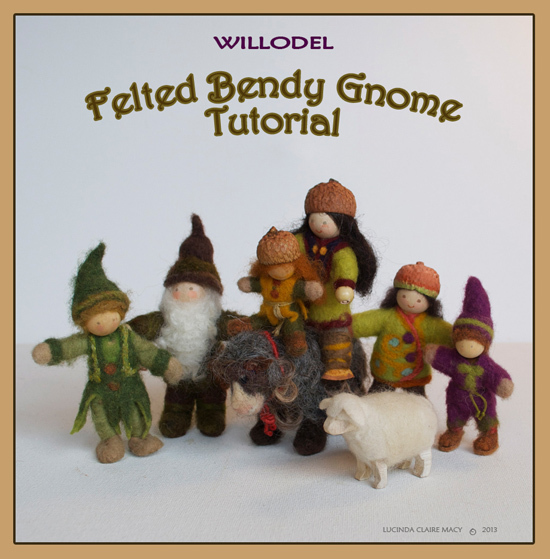 This tutorial is designed to pass along my own creative ideas as the simplest way to make pose-able needle felted figures for stories and gnome play. The possibilities are pretty limitless. You can use scraps of things you already have at home, I always encourage using “found” materials, and things you might have to buy, like covered florist wire, are not expensive. The size of the figures in the tutorial are 4″ to 5″, but this can be changed to anything you like. Your main tool for the frame are wire nippers(called “diagonals” and needle nose pliers. You want to be sure that in making the frame there are no pointy ends that might poke through anywhere. Also, I do not hesitate the add a drop of glue where I need to starting winding some wool and definitely use this for attaching hair and hats. 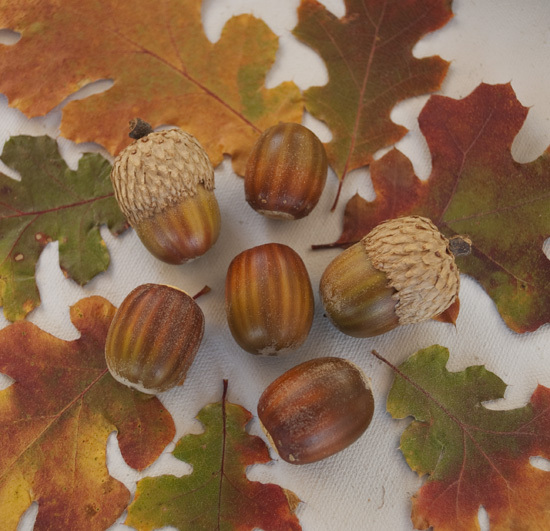 I like using acorns for hats, but there are many other approaches to the this part of the clothing. Please do not hesitate to write if you have questions. 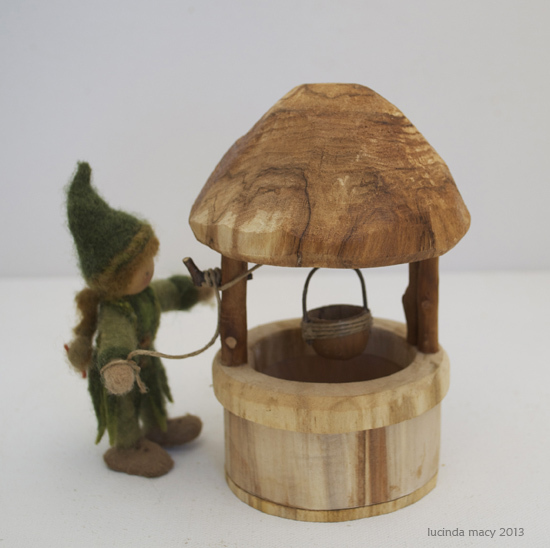 This is Leif the Elf, working with his wishing well.This little Elf has been a model for many of my homes and other tutorials, proving himself versatile and durable over several years. He is 45″ tall. 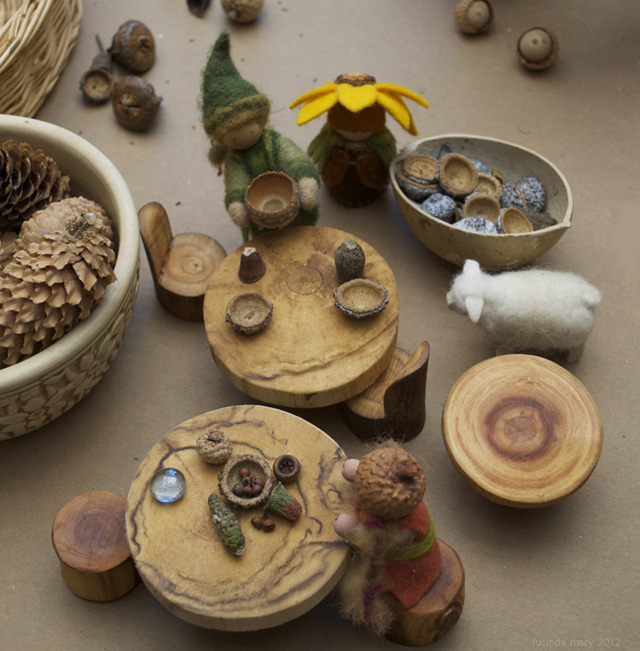 Here are an array of bendy figures, including gnomes, elves and animals. As Fall turns to Winter and the Holidays are upon us, it is special and busy time of year. There is the rustle of falling leaves on the ground, the color of pumpkins and dried corn and the wondrous smell of pumpkin and apple pie in the kitchen! Then come the wafts of balsam and douglas fir, apple cider and the sound of the crackling fireplace. 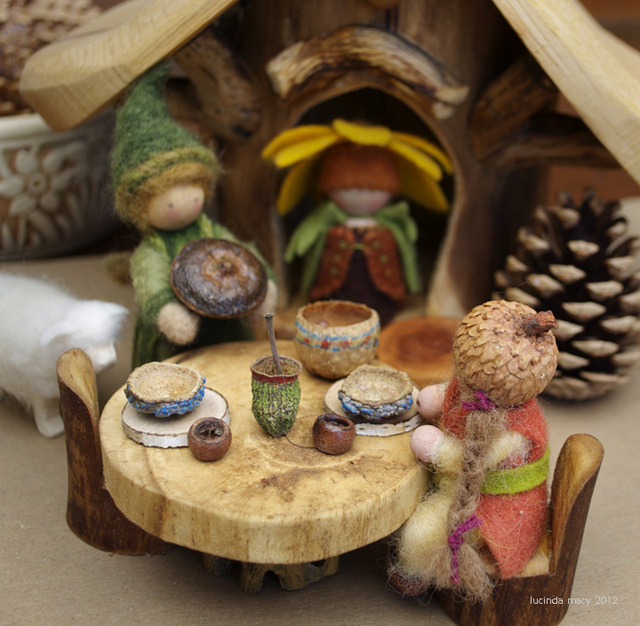 It is also a fun filled time of making things with harvest from the garden and the woods. A delightful project for family and friend! 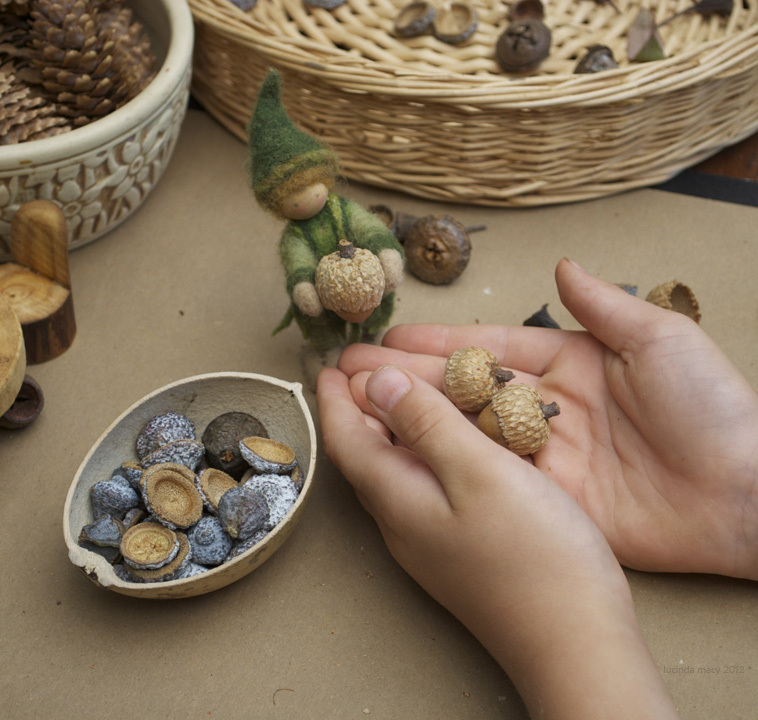 One of our families favorite projects is making ornaments from pine cones and acorns and colored leaves. There is a great many variations on the basic theme and from year to year they take on new appearance and personality. Along with the ornaments we make pomanders, and garlands from pinecones, acorns, leaves, cranberries and anything else we find that we like. 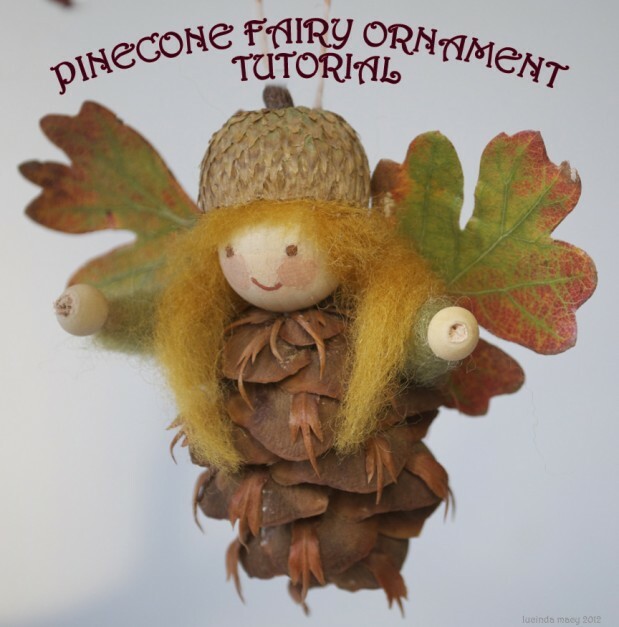 Please follow this link for a fun pinecone fairy tutorial to make with family or friends to enjoy this season. There is something magical about seed pod dishes! I think it not too hard to believe that the wee folk in our lives actually must use such dishes for their table settings! And so many of us love looking at and collecting seed pods, that it is always wonderful to find a special use for them. Most all of the ones you see here are some variety of eucalyptus pod or acorn cap. The variety of eucalyptus seed pods goes from small to large and they all smell wonderful when you sand them. With some observation on walks, you can learn when various bushes or trees have seed pods and when the best time to collect them is. A lot of times you can collect them when they are still green, but done growing and they will turn brown as they dry. I try to find “new” seed pods, from the current season, so they are in nice condition and not deteriorating. The tools for making these are quite simple and readily available. 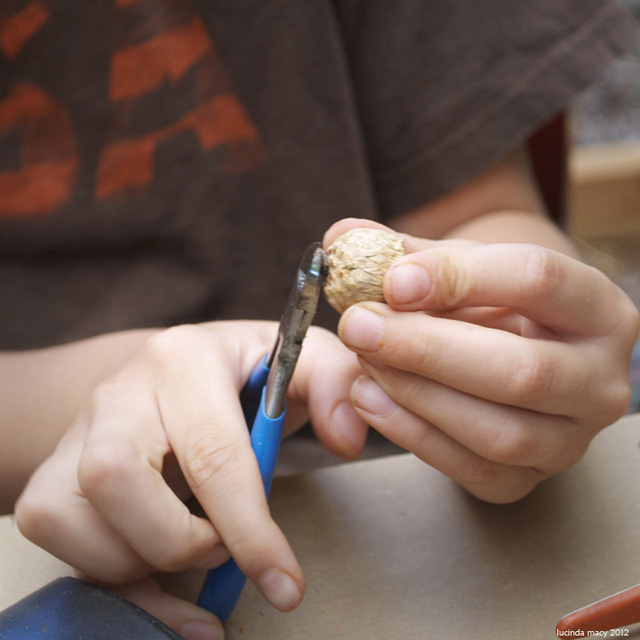 They are all hand tools, so you can do this at an outdoor table or indoors, but do not need a shop. If you do not have any tools, you can do this still, just with some sand paper, getting some 80 grit and some 120 grit sizes. 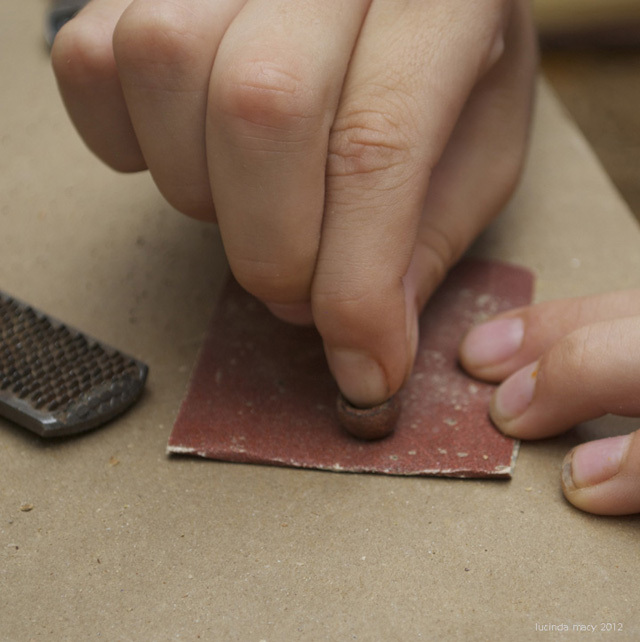 I also use small rasps and files that last forever and work the same as sandpaper, which will wear out. The rasp is a wood working tool with a course side and a medium side and can be very handy for wood working. Simple hand tools for wood working are readily available in the hardware store. You will need some tool to cut the stem off. I use wire cutting pliers, called “diagonals” because they are small and strong. You could also use pruning sheers of a small size or even utility scissors or sharp knife. Always protect the work surface and be careful if you use a utility knife or other knife. 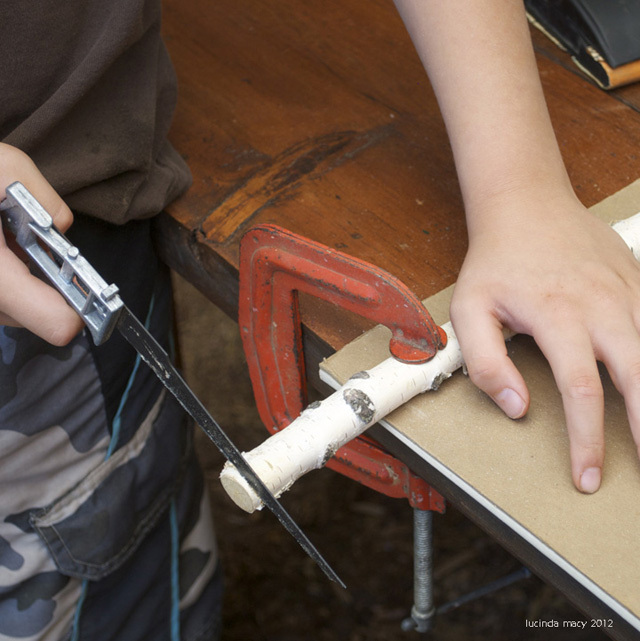 Putting down a piece of cardboard or brown paper on your work surface is always a good idea. 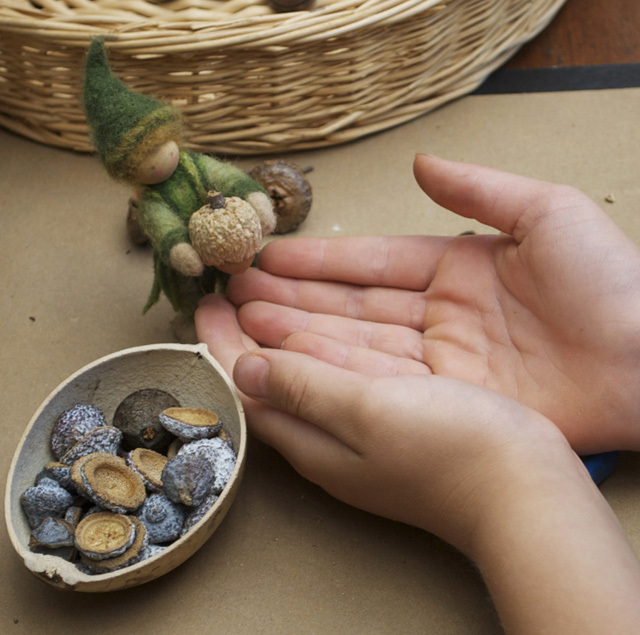 Acorn caps make wonderful cups and bowls. 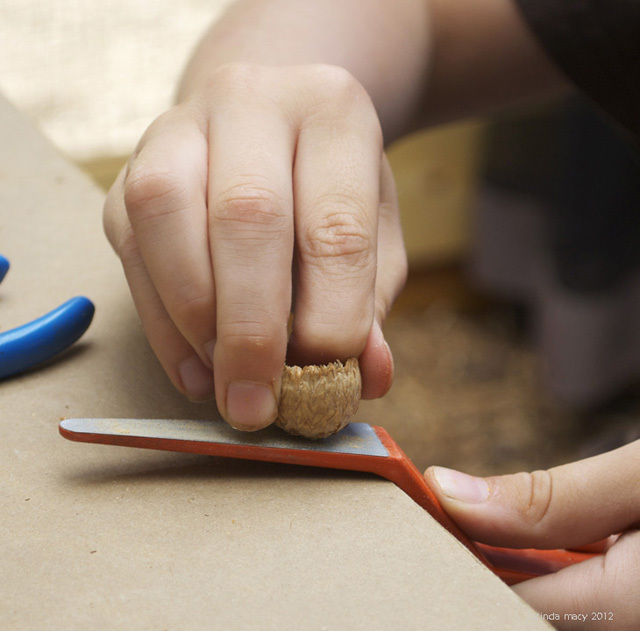 The cap will be turned upside down to become a bowl or cup and the stem must be cut off as close to the cap as possible I have found that wire cutting pliers, which are strong and have a fine point, are great for this. Small pruning sheers will also work. After the stem is removed, the next step is to sand or rasp the acorn cap nice and flat so that it will sit level on the table. The seed pod material is usually not very hard and is easy to sand down, so keep checking as you go so you don’t go too far. 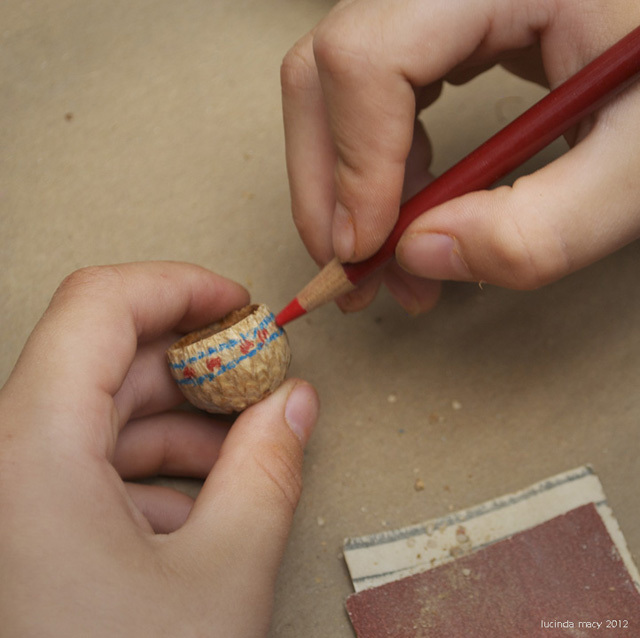 The small sanding rasp works very well for flattening the bottom of the acorn cap. Take care to get this level , checking every once in a while to see if the cup is going to sit “flat” on the table and is not tilted. Decorating the seed pod cup or bowl is entirely up to the maker, here colored pencils are being used and paints can also be used. 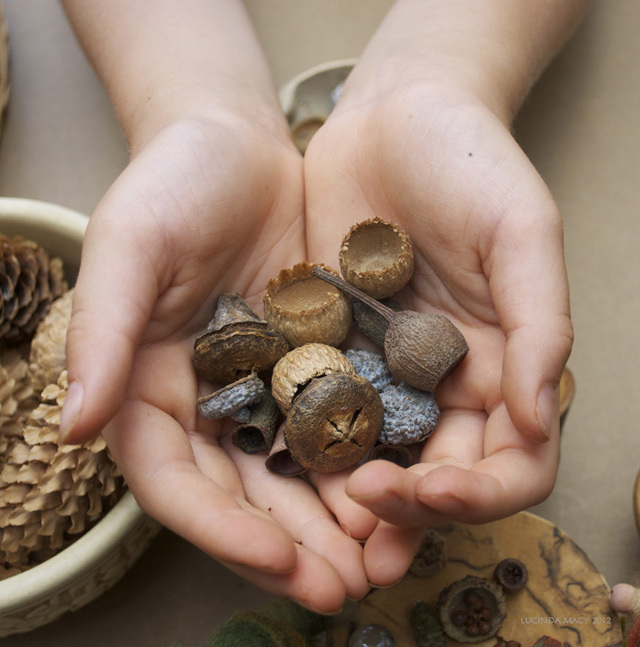 The simplest way to decorate the seed pods for children is with colored pencils. Paints can also be used and of course there is no end of possibilities in regards to decorating, and even making a whole set of matching dishes! Oops, Acorn elf knocked over her cup! She is so glad they cannot break! She is thinking maybe this little cup needs to flatter on the bottom! Making plates and saucers is readily done by finding dead limbs of soft wood. Here you see a birch limb, which is easy to cut and about an inch in diameter. The handy little utility saw, which as fine teeth so it is easy to cut with, came from the local hardware store. Clamping the stick to the table is the best way to keep it still and not roll. What is important in this process is to keep the saw straight and vertical while sawing! This is what makes flat, even dishes. This is accomplished with practice ! This very tiny eucalyptus pod makes a perfect fairy cup for periwinkle tea! Simply sanding the bottom flat is all that is needed. This seed pod looked remarkably like a pie or casserole ! Using the rasp, an 18th of an inch was take off to make it the right height. This larger , unopened seed pod very much looked like a pie to us. Using the rasp, about 1/8th ” was removed from the top , to make it about the right height. You can see this on the table of the next picture. The seed pod dishes will be used and loved and if lost..Make more! Here are the dishes being used at the Acorn Cafe! The blue bowls are eucalyptus caps , sanded on the bottom like the acorn caps were. Now, where ever you go you can be looking out for seed pods you can use for wee folk dishes! It is such a pleasant past time . Please do not hesitate to ask any questions! A special part of the growing season is the making of Calendula soap. This is the only soap I have used now for over 10 years and it is extremely popular amongst friends and family. I generally also use it for Holiday giving. Many have done the “melt and pour” soap making and this little article focuses on the addition of calendula to the soap, rather than the process iteself. If there is interest in the basics of “melt and pour ” soap, please mention it in the comment section! The calendula is grown in the garden for the purpose of the soap. What is different about this soap, which has a vegetable glycerin base, is the process of adding the herbal essence to it. Many years ago I learned about making Calendula cream or salve for healing the skin. I decided to follow the same principle of making the healing cream or ointment to add the healing qualities to the soap. Many people suffer from various skin disturbances and this soap will bring soothing and healing. This process uses the fresh plant, freshly cut from the garden. All the parts of the flower above ground may be used. The flowers, buds, leaves and stems are collected and chopped into small pieces. The parts used should be young and fresh, avoiding old and withering parts, and clean. The plant material is finally chopped for adding to the soap base and can also be macerated with a rolling pin to help it absorb into the soap base. I use a heaped double handfull of plant and blossoms for about 3 lbs of soap base. 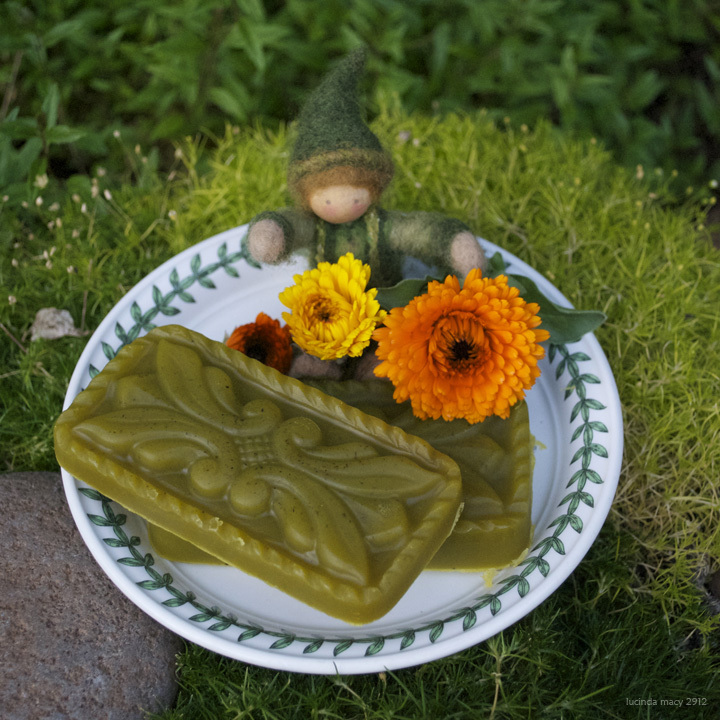 The soap base is cut up into 1″x1″ cubes to melt quicker in the pot. The soap base is melted in a double boiler or a pan inside another pan with water. The quality of soap base is important, all melt and pour soap bases are not the same and it is good to find out from the source, what it is in it. I try to find the simplest base with the fewest “extra”ingredients. You do not want to “cook” the calendula, so it is stirred into the soap base with a wooden spoon, once the base is entirely melted , but the heat source turned off. This is to preserve the vital elements of the calendula as much as possible. 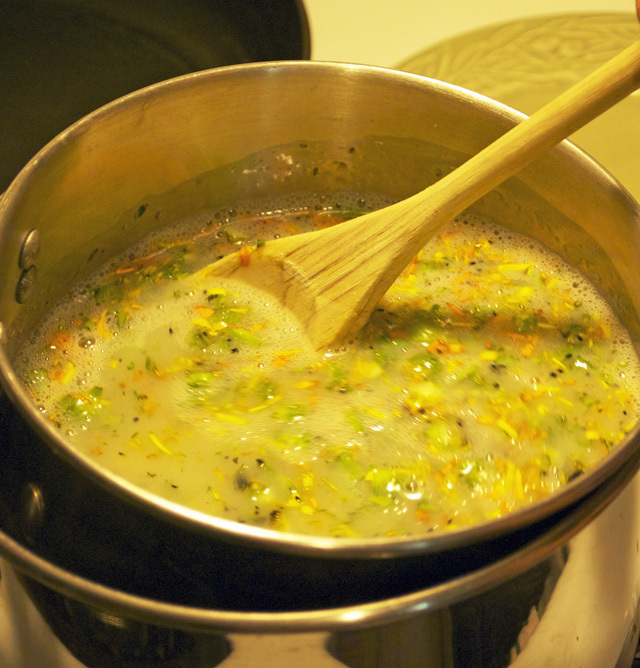 The finely chopped pieces are added into the soap base when it is completely melted and the stove tuned off.It is stirred gently until all the pieces are submersed. Once the calendula is well stirred in, the pot is set aside to harden over night or for a day. The soap base will begin to set up as soon as the heat is off the pan, so you want to have the calendula all ready before you turn off the pan. Stirring gently is important to cut down on the amount of bubbles. During this cooling down period and setting, the essence of the plant and flowers are drawn out of the plant material and into the soap. The next day the soap is gently melted again, stirring gently along the way. This is only done long enough to make the pot entirely liquid again. The mixture must then be run through cheese cloth or a fine sieve to remove the plant material out of the soap base. I find the easiest way to do this is using another pot. Once the soap has been filtered it is ready to pour into the molds. during the use of the cheese cloth or sieve, it may be necessary to warm up the base again to have it entirely liquid for pouring into the molds. 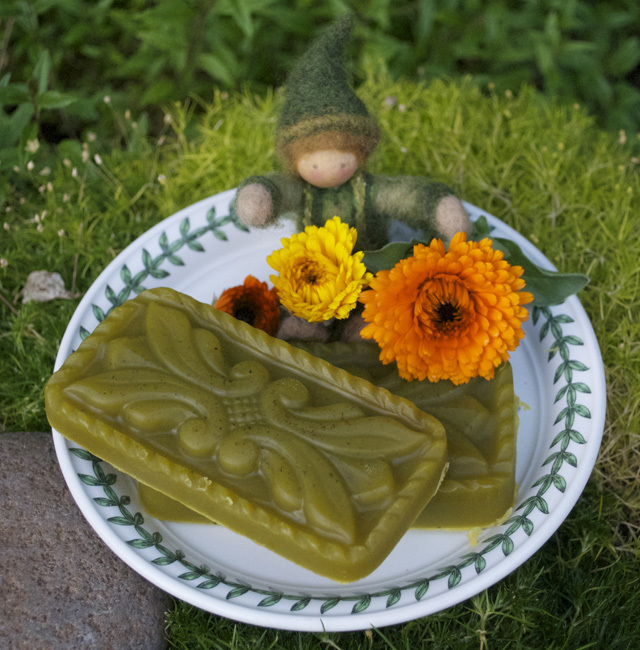 The soap has now become a beautiful hue of green or gold, depending the mixture of flowers and leaves or other parts that you used. I add some essential oils just before pouring into the molds, such as lemon grass, ylang ylang and clary sage. Once the molds have hardened and are ready, I take the soap out gently and put them in cellophane or wax paper bags. I store the soap, which I will keep till next season, in the refrigerator to preserve the natural oils and healing herbal essences in the soap. Because the soap is free of preservatives and chemicals, to last and keep its healing powers, it needs to be kept in a cool and dark place. I have also done this process with fresh lavender , yarrow and comfrey. Please feel free to ask any questions you might have! It has been a long winter indoors and I have enjoyed doing handcrafts at the kitchen table, but I am so eager to spend time outside! Spring has come at last & life is bursting forth everywhere! I live high in a mountain climate near Mt . 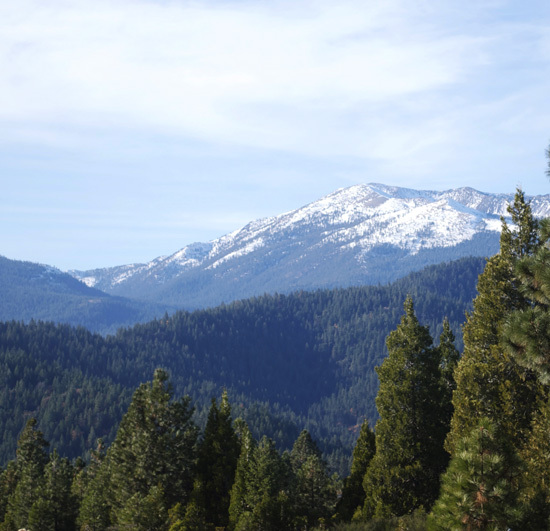 Shasta, CA. Spring and Summer come later than in the low lands. Together we will look around the yard that is my home. 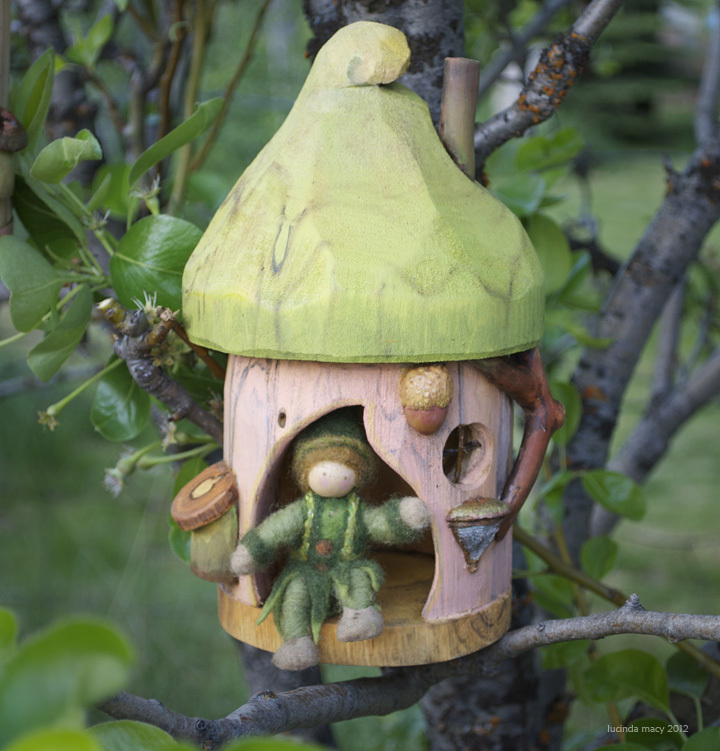 In my yard there are fruit trees, flower beds, Toad ponds, vegetables, herbs and lots of bird houses! Beyond the yard there are woods, fields and ponds, but they are very wet and we will visit those another time! My summer house is in a little pear tree in the yard. I like it there because it is shady in the hot summer sun and honey bees visit me in the Spring while looking for pollen in the flowers. Many birds stop by looking for insects on their way to the bird bath or home. So we will start our adventure here in the Pear tree! 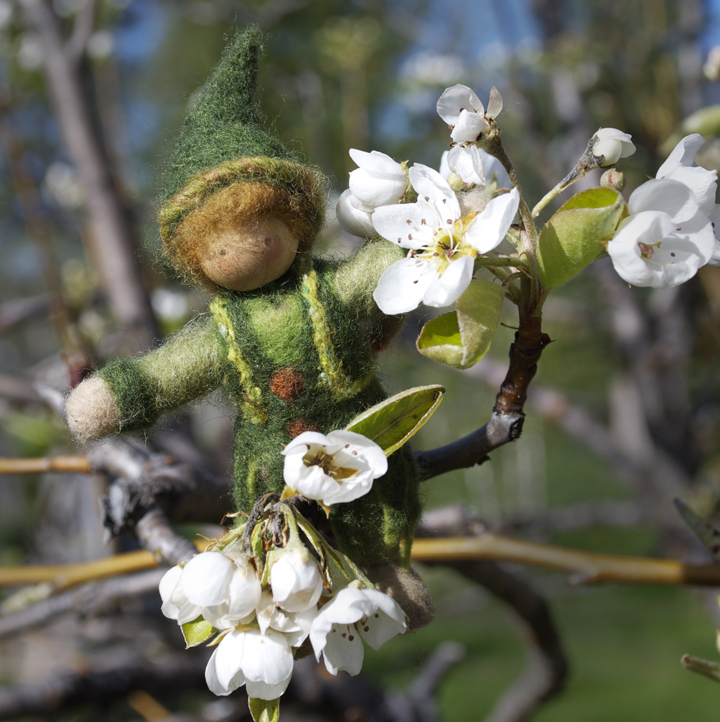 The pear blossoms are lovely white and there are so many bees collecting pollen in the tree that you can hear the hum of their busy wings clear across the yard! Bees are our garden friends who pollinate the trees to make help lots of fruit. Honey bees are very busy about their work in the Spring and Summer when it is warm. They need the flowers to collect their pollen from. In the colder seasons, they hibernate. Honey Bees and Bumble Bees are quite friendly and like them all! 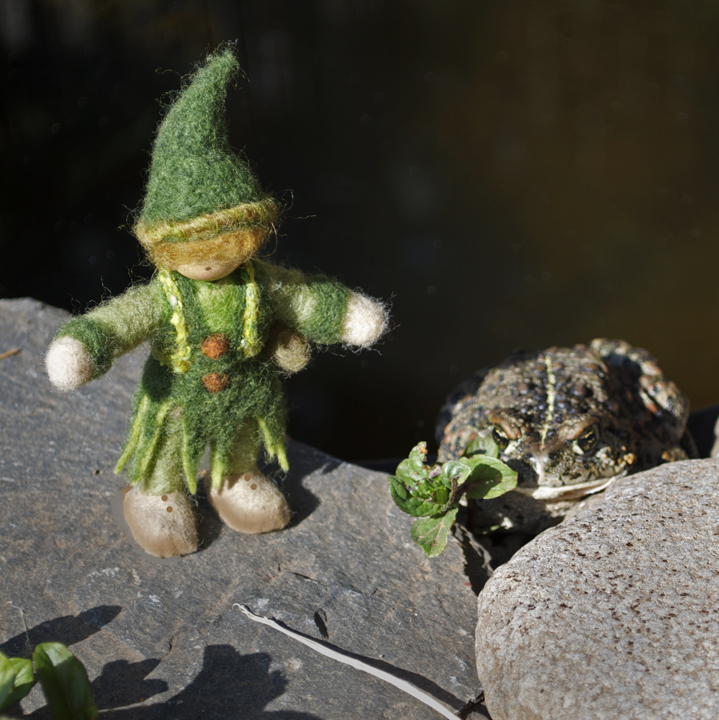 Next I am going to hop to the ground and look for Jedediah, one of the garden toads. Jed always suns himself in the same place on the edge of the Toad Pond. He is one of my best pals, always friendly and so helpful in the yard. He eats all the bugs that eat the plants! He also eats mosquitos and flies. During the winter Jed digs a hole in the ground and hibernates, which is like a deep sleep, until the sun warms up the Earth and he can come out again. I will also drop by his house so you can see where he lives! Toads like houses to have a shady place when it gets hot and to rest in when they are not eating bugs or spending time in their pond. It is such a nice day, it just makes me want to run and jump and skip! I am passing by the lovely little blue veronica speedwell, a helpful plant named after a Saint! We use this little blue ground cover to fill in all the empty places and let it cascade about the rocks and stones. It is the first plant to flower in the Spring after the daffodils, it is very hardy and comes back every year! Running through blue the Veronica Speedwell! 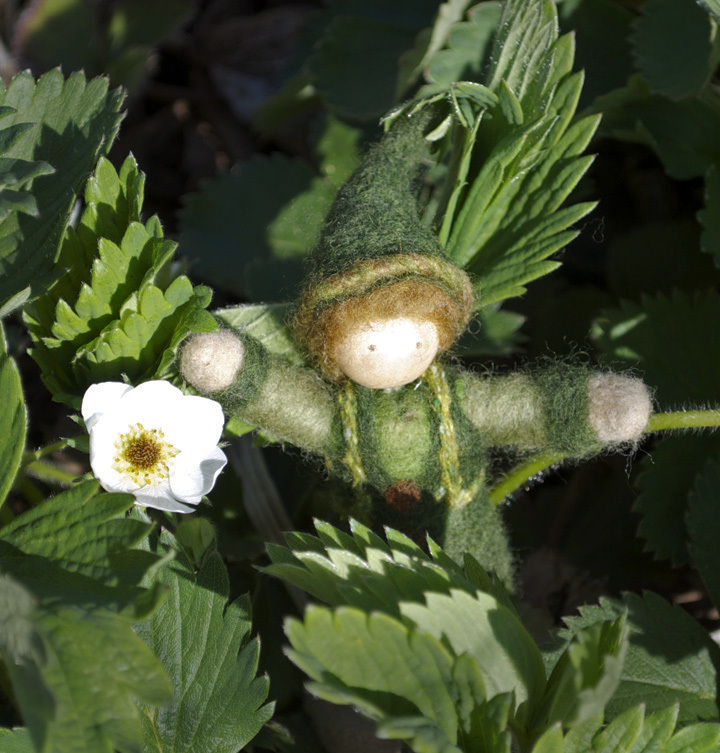 Now I have reached the vegatable patch and have found strawberries in bloom! This is always exciting because the beautiful white blossoms will turn into sweet red strawberries, such a wonderful treat to eat! The strawberry patch always smells so good! We also grow squash, lettuce and green beans in the garden. We have a short growing season where we live because of the high mountain climate. Spinach, broccoli and lettuce can grow even if it get’s cold at night. Next to the strawberries I also found some Lemon Balm, a lovely herb that smells just like lemons. In the summer we put crinkled leaves into a pitcher of ice water or make tea, both refreshing and relaxing. So nice to have all these useful plants around & the toads to watch over them! 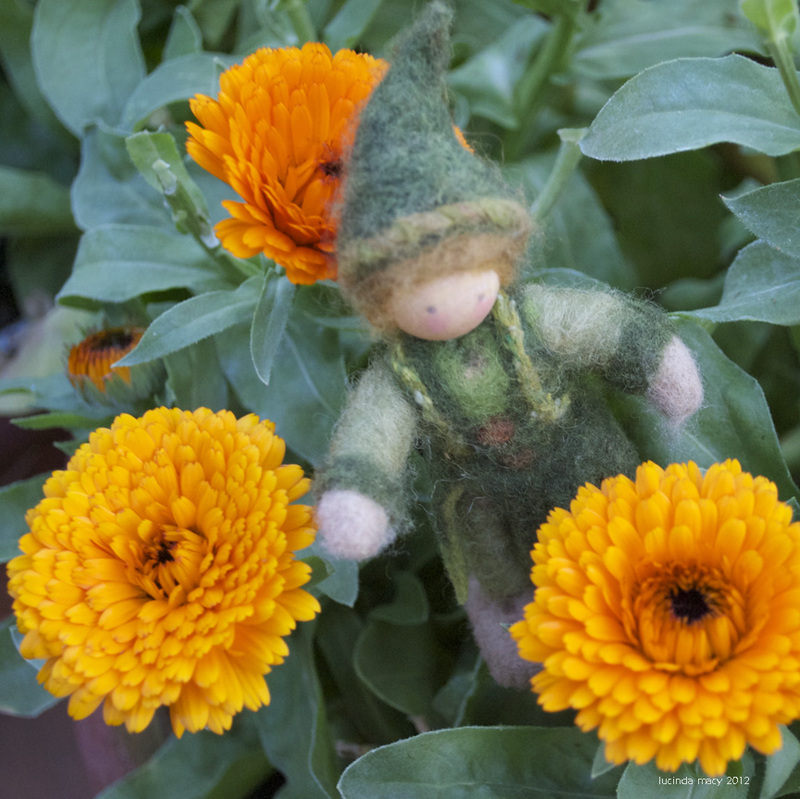 They also get to watch over the calendula flowers in the herb garden. 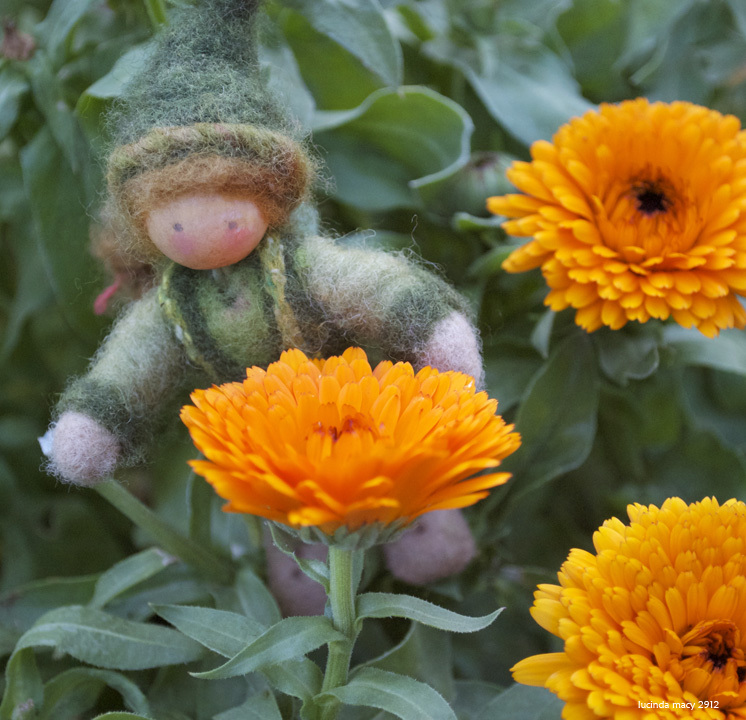 The calendula flowers, sometimes called “winter marigolds” are very important to us. Calendulas are very useful and healing to the skin. We make soap using both the flowers and the leaves infused in a vegetable glycerin base. Over the summer we make enough soap to last all winter and use for Christmas gifts for family and friends. We put lemon grass, sage and ylang ylang oil in the soap too to make it smell good. 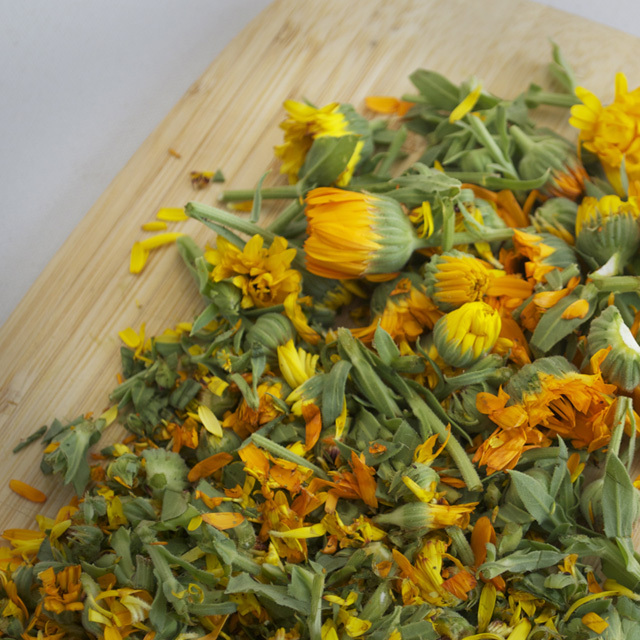 The lovely green color is the natural color made by using the calendula plants. Now I am going to the near by fence to climb up the post to vist one of the bird houses. 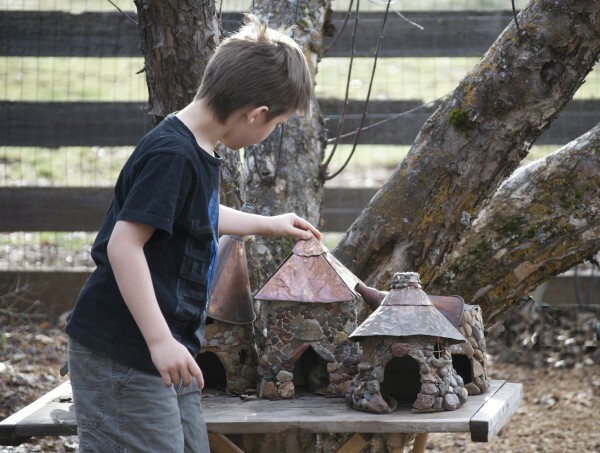 The songbirds work with the toads to eat pesty bugs and take care of the garden and yard. They also fill the air with their lovely songs and help wake us up with their music at dawn. The house I have reached is being used this year by Mr. & Mrs. Tree Swallow. Such a beautiful blue color and bright white chest they have. Did you ever notice that some bird pairs look different, the male bird being brighter than the female bird? And other kinds of birds, they look both the same? Well, the pairs that look just the same are birds that stay together their entire life and the different looking ones find a new partner each Spring. 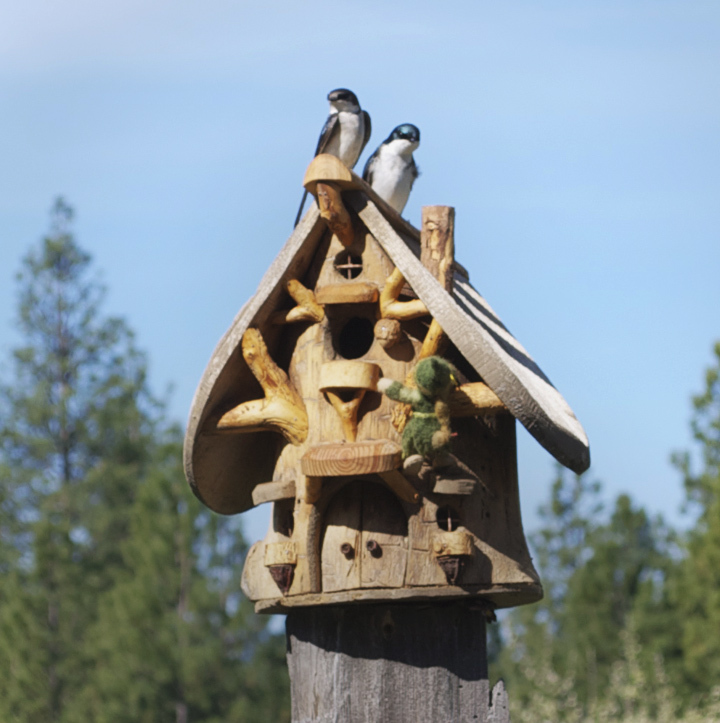 So let me introduce you to Mr. & Mrs. Tree Swallow! They have raised a family of 4 in this house! After the baby birds come out of the house and fly for the first time, they stay in the area feeding and making their wings strong for their flight south in when Winter comes. They will return again in the early Spring of the following year. It is very good for us all to help the birds by putting out houses for them as often it is difficult for them to find places to make their nests. 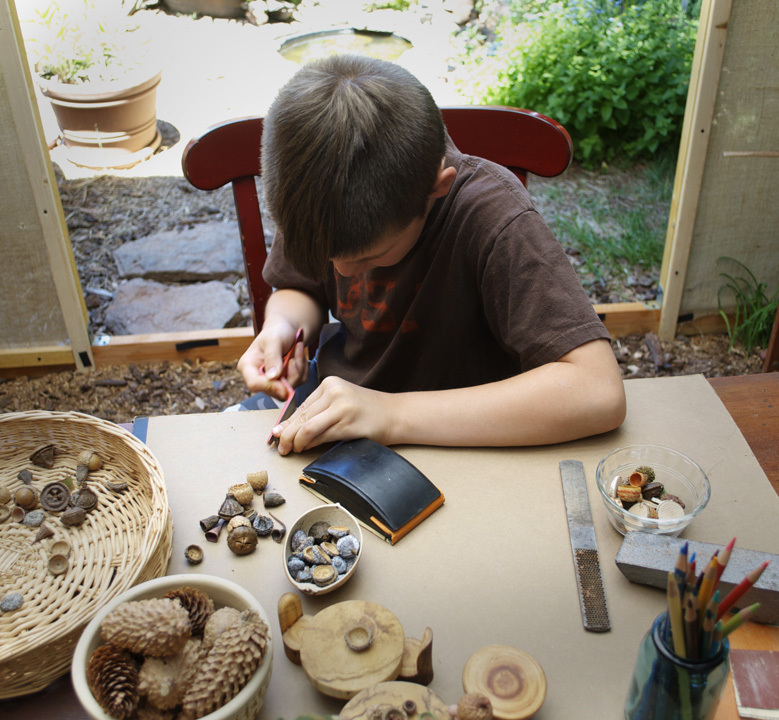 Across the yard from the Tree Swallow house is our Summer work table. This is a big table we made from old lumber that we use to work on as well as eat outside, sometimes for breakfast and for summer evenings. It has a shade structure over it and is next to the toad ponds. This is a peaceful and inspiring place to work, next the gardens, herbs and toad ponds. We have been making Fairy, Elf and Gnome dishes the last few days! A lot of the work we do is hand work, making things out of wool and felt , putting oil and beeswax on the wooden houses, drawing and painting pictures and sorting seed pods and pine cones. All this work is pleasant to do where we can hear the birds singing, the wind blowing in the tall pine trees and the toad plopping into the water of their pond. I love helping with the work! The last place we will visit today is one of my favorite places! The bird bath! This is a place birds come to get a drink and also take a bath! Birds need to take baths too! They also need a place to drink all year. In the winter we try to keep water that is not frozen available for them in the winter. Every day about 4:30 the yellow warblers stop by to twitter and hop about in the bird bath! I like to sit on the edge & watch them! 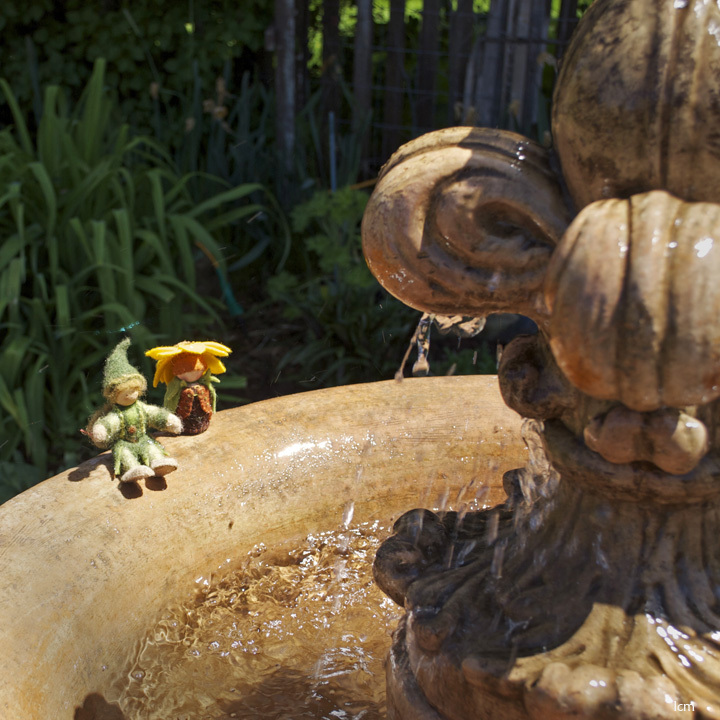 This is the large bird bath and fountain. I am visiting here with my friend! Thank you everyone! Thank you for going with me ! It is going to be a busy season with lots of time out of doors and longer days. 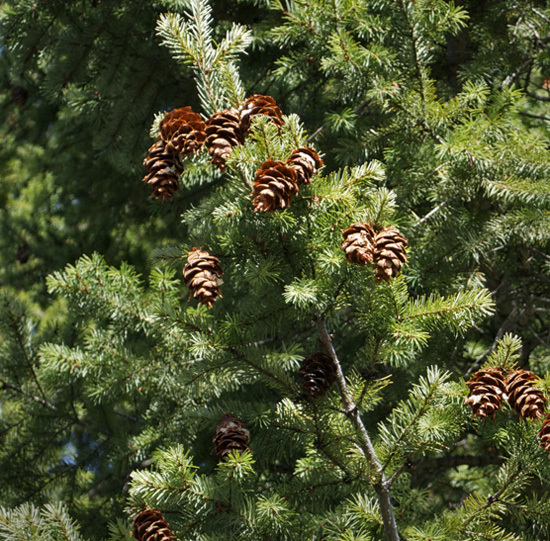 We will be gathering sticks and wood from forest and then collecting acorns and other seed pods when they fall from the trees in late summer. 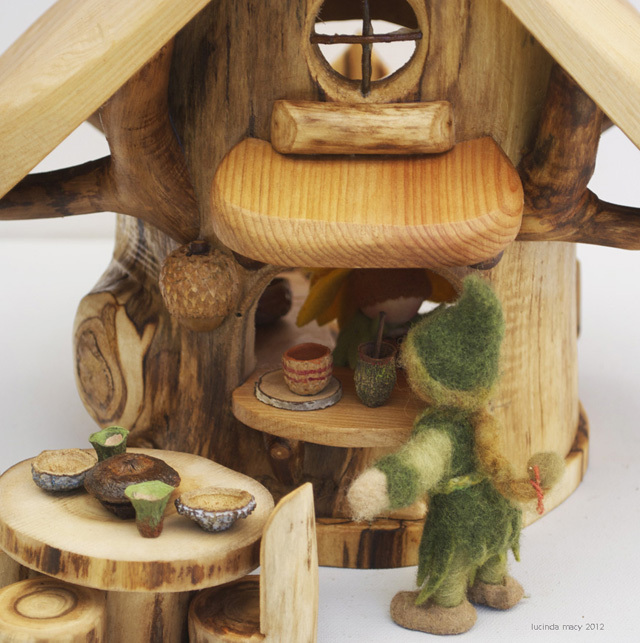 We also collect plants for summer tea and and dried grasses for fairy house roofs. Maybe we can meet again in the Autumn and see what we have made! Bye~~~!